Directorate of Health's statement (below) in their 2016 article published in Tidsskr Nor Legeforen betrays their confusion and competence. First, in Terminhjulet, EDD is calculated from a prediction/estimation of fetal age (or GA) using the equivalent of Naegele's rule. NCFM eSnurra Group's GA is calculated using the equivalent of Naegele's rule, in reverse, from an EDD date which is calculated from a direct prediction/estimation of the number of remaining days of pregnancy from the ultrasound date to birth/delivery date. There are natural differences in the ultrasound measurements depending on when the ultrasound measurements are made; and, there are distinct differences in the 2 medical protocol practiced by Bergen Group with Terminhjulet (evidence-based medicine) and the protocol practice by NCFM eSnurra Group's "method" (evidence-obviated medicine). Second, Fetal age and EDD do "need to be considered in conjunction." The conjunction in which fetal age and EDD need to be considered is the fact that actual birth/delivery date varies, naturally, over a 35+ day range, even when fetal age and gestational age (GA) are measured exactly from time of IVF or ovulation. Consequently, fetal age and gestational age should be established as directly, early and accurately as possible by including "all available information when fetal age is assessed" to ensure and accurate temporal frame of reference to ensure optimal obstetric and fetal awareness to ensure optimal obstetric and fetal management. NGF i.e., Norsk gynekologisk forening (Norwegian Gynecological & Obstetrics Association) made this clear to Directorate of Health (Hdir). Included below are excerpts from NDG's 2014 article "NGF tar avstand fra Helsedirektoratets anbefaling for fastsetting av svangerskapslengde og termin." Specifically, Torunn Janbu and Directorate of Health make it clear in their article they do not understand the basis for determining fetal age is not the end of the pregnancy, but its beginning (excerpt below). Also, the "Evaluations (7 – 9)" Torunn Janbu cited are the same 3 NCFM eSnurra Group papers Directorate of Health delivered to NOKC via references, twice, in their official request to NOKC, for NOKC to send back to Directorate of Health as NOKC's official assessment recommending NCFM eSnurra Group's "method" as the implementation vehicle for Directorate of Health's knowledge-obviated, medically & ethically flawed, intentionally reckless, willfully negligent 2014 Recommendation with their government-mandated protocol of evidence-obviated medicine. To paraphrase the excerpt above: Evaluations (7 – 9) which consisted of the 3 NCFM eSnurra Group papers included within Inger Økland's 2012 NTNU dr.philos. Thesis with 14 total authorship credits shared among 6 NCFM eSnurra Group authors, 3 of whom are the 3 "claimed" copyright owners of the NCFM eSnurra "method" show that NCFM eSnurra Group's exclusive evaluation criteria and methodology of NCFM eSnurra Group's "method" (i.e., the appropriated, plagiarized, misused Hutchon Method of PDEE) relative to Bergen Group's Terminhjulet method had determined NCFM eSnurra Group's "method" was superior to Bergen Group's Terminhjulet method because Terminhjulet was "biased." Pay no attention to the man behind the curtain. Moreover, it appears Torunn Janbu was not aware Dr. Hutchon's original idea and method, the Hutchon Method of Population-based Direct EDD Estimation (PDEE) had been formulated by Dr. Hutchon and published, along with a demonstration of the method using a dataset of both CRL and BPD in his seminal Hutchon 1998 and website 7 years and 9 years before NCFM eSnurra Group's Eik-Nes et al. 2005 and Gjessing et al. 2007, respectively, in which NCFM eSnurra Group laid claim to Dr. Hutchon's original idea and method as their own original idea and method, thereby engaging in ongoing research misconduct via plagiarism for the last 12-years. In his seminal Hutchon 1998, Dr. Hutchon explicitly warned against using Population-based Direct EDD Estimation to assess GA and fetal age because Dr. Hutchon understood that the basis for determining fetal age is not the end of the pregnancy, but its beginning and that all available information should be used when assessing fetal age. This is covered in detail elsewhere in this document. Additionally, Torunn Janbu ignored all the obstetric & fetal medicine experts who had so clearly and explicitly warned of the risks and consequences: "that critical mistakes may follow from the failure to include all available information when fetal age is assessed," as was explained above, but bears repeating. Directorate of Health completely ignored fact-based evidence of serious data irregularities with respect to the integrity of the BPD data in NCFM eSnurra Group's studies and publications. "the comparative evaluation of the two methods really amounts to comparing apples to pears." The objectives of the NCFM eSnurra Group study, as articulated in Gjessing et al. 2007: "A direct method for ultrasound prediction of day of delivery: a new, population-based approach" (excerpt below) were clearly defined and explicitly stated by the 3 NCFM eSnurra Group authors; the 3 "copyright owners" of NCFM eSnurra (© 2007 EikNes, Grøttum og Gjessing); the 3 NCFM eSnurra Group coauthors of Eik-Nes et al. 2005 and Gjessing et al. 2007 which appropriated Dr. Hutchon's original idea and method, the Hutchon Method of Population-based Direct EDD Estimation (PDEE), as their own original idea and method from Dr. Hutchon's seminal Hutchon 1998, website and other publications, in NCFM eSnurra Group's Eik-Nes et al. 2005 and Gjessing et al. 2007, thus engaging in research misconduct via plagiarism for the last 12 years. Moreover, NCFM Snurra/eSnurra Group participated in a recognized collaboration, foregoing authorship credits, which resulted in Taipale & Hiilesmaa 2001, which also appropriated and plagiarized the Hutchon Method of PDEE. "... the aim of this study was to develop a method for estimating expected day of delivery and gestational age based on a large population" (Source: ibid., p. 20). .It was clear the study was regressing on fetal metric measurements to estimate the remaining days (RE) until date of delivery (EDD), but the study makes no mention of regressing on fetal metric measurements to be able to estimate GA. In short, there was no wherewithal to estimate gestational age; the wherewithal never existed, as is usually the case with mission creep and mission leap. Consequently, it was not possible for the NCFM eSnurra Group's Gjessing et al. 2007 study to estimate gestational age. Therefore, gestational age (GA) had to be calculated, not estimated, by using the equivalent of Naegele's rule, in reverse, by subtracting the estimated RE days on the date of the ultrasound exam from the study's defined 283 day gestation period to calculate GA on the date of the ultrasound exam, which, by definition, included the use of a virtual LMPD (i.e., GA = 0w+0 (or day 0 of the study's defined 283 day gestation period). This argument was made 3-years earlier in 2014 by Synnøve Lian Johnsen, MD, PhD, Section Chief for Fetal Medicine & Ultrasound, Haukeland University Hospital Women's Clinic in her request to the National Knowledge Center for Health Services (NOKC) titled "Age Determination of Pregnancy" (Forslagsnr: 2015_005, Received 01.11.2014). Moreover, Synnøve Lian Johnsen advanced the argument by attaching Bergen Group's study, "Fetal size in the second trimester is associated with the duration of pregnancy, small fetuses having longer pregnancies" or Johnsen et al. 2008 to her 01.11.2014 request to NOKC (Forslagsnr: 2015_005, 01.11.2014); a request which stated key issues disclosed and discussed within LailasCase.com 3 years before LailasCase.com was published. The Abstract of Bergen Group's Johnsen et al. 2008 is included below. However, Dr. Johnsen advanced the argument with the results and conclusion from Bergen Group's Johnsen et al. 2008 (below). Background Conventionally, the pregnancy duration is accepted to be 280–282 days. Fetuses determined by ultrasound biometry to be small in early pregnancy, have an increased risk of premature birth. We speculate that the higher rate of preterm delivery in such small fetuses represents a pathological outcome not applicable to physiological pregnancies. Here we test the hypothesis that in low-risk pregnancies fetal growth (expressed by fetal size in the second trimester) is itself a determinant for pregnancy duration with the slower growing fetuses having a longer pregnancy. Methods We analysed duration of gestation data for 541 women who had a spontaneous delivery having previously been recruited to a cross-sectional study of 650 low-risk pregnancies. All had a regular menses and a known date of their last menstrual period (LMP). Subjects were examined using ultrasound to determine fetal head circumference (HC), abdominal circumference (AC) and femur length (FL) at 10–24 weeks of gestation. Length of the pregnancy was calculated from LMP, and birth weights were noted. The effect of fetal size at 10–24 weeks of gestation on pregnancy duration was assessed also when adjusting for the difference between LMP and ultrasound based fetal age. Results Small fetuses (z-score -2.5) at second trimester ultrasound scan had lower birth weights (p < 0.0001) and longer duration of pregnancy (p < 0.0001) than large fetuses (z-score +2.5): 289.6 days (95%CI 288.0 to 291.1) vs. 276.1 (95%CI 273.6 to 278.4) for HC, 289.0 days (95%CI 287.4 to 290.6) vs. 276.9 days (95%CI 274.4 to 279.2) for AC and 288.3 vs. 277.9 days (95%CI 275.6 to 280.1) for FL. Controlling for the difference between LMP and ultrasound dating (using HC measurement), the effect of fetal size on pregnancy length was reduced to half but was still present for AC and FL (comparing z-score -2.5 with +2.5, 286.6 vs. 280.2 days, p = 0.004, and 286.0 vs. 280.9, p = 0.008, respectively). Furthermore, studies increasingly show pregnancy duration varies, naturally, by as much as 5 weeks when controlled for ovulation. One can only wonder if Directorate of Health understand the obstetric and fetal medicine implications of the results of this study (excerpt below) and other studies with respect to the variances at play. Incredulously, Dr. Johnson's request to NOKC (Forslagsnr: 2015_005) with Bergen Group's Johnsen et al. 2008 attached were ignored by NOKC and Directorate of Health, which begs the question: How was it possible for NOKC to ignore the caliber of research, scholarship, experience and evidence presented in Dr. Johnson's request which included that which was presented in Bergen Group's Johnsen et al. 2008? The answer is both simple and obvious. At the time, NOKC formally reported to Directorate of Health. And, as is made perfectly clear below, NOKC had been directly and specifically "instructed in professional matters" by Directorate of Health via their request to NOKC (Forslagsnr: 792, 15.11.2013) a.k.a. "the fix" regarding what they wanted and needed from NOKC to effect their knowledge-obviated, medically & ethically flawed 2014 Recommendation with their exclusive NCFM eSnurra Group's "method" (i.e., the plagiarized, intentionally misused Hutchon Method of PDEE) within a government-mandated protocol of evidence-obviated medicine. Not coincidentally, the term "the fix" is a euphemism for that which is effected by those who are "instructed in professional matters." Notice the word "instructed" is a euphemism. The nesting of euphemisms is also no coincidence, as this is the vernacular of the modus operandi known as "the fix." "The National Knowledge Center for Health Services provides and disseminates knowledge of the effects of methods, means and measures and of quality in all parts of the health service. The goal is to make good decisions so that users get the best possible healthcare. The center is formally a governing body under the Directorate of Health, without governmental functions. The Knowledge Center can not be instructed in professional matters.​"
Norwegian: (Nasjonalt kunnskapssenter for helsetjenesten fremskaffer og formidler kunnskap om effekt av metoder, virkemidler og tiltak og om kvalitet innen alle deler av helsetjenesten. Målet er å bidra til gode beslutninger slik at brukerne får best mulige helsetjenester. Senteret er formelt et forvaltningsorgan under Helsedirektoratet, uten myndighetsfunksjoner. Kunnskapssenteret kan ikke instrueres i faglige spørsmål.) (Source: "Utprøving av mini-HTA i Helse Vest RHF, Notat fra Kunnskapssenteret april 2011" Notat: ISBN 978-82-8121-404-0; april 2011. Nasjonalt kunnskapssenter for helsetjenesten. It is important to note the Norwegian Knowledge Centre for Health Services (NOKC) was eventually extricated from their organizational reporting position under Directorate of Health. NOKC became part of Norwegian Institute of Public Health (NIPH) beginning 01.01.2016. Directorate of Health's Request to NOKC a.k.a. "The Fix"
Also, in their official request (Forslagsnr: 792, 15.11.2013) to NOKC Grøgaard & Sommerstad identified 3 specific NCFM eSnurra Group papers published in Ultrasound in Obstetrics & Gyncecology (UOG) by title and journal reference (excerpt below). References: 1. bias of traditional term prediction models: results from different sample based models evaluated on 41,343 ultrasound examinations. Ultrasound Obstet Gynecol 2010; 36: 728-734. 2. A new population-based term prediction model vs. two traditional sample based models: validation on 9046 ultrasound examinations. Ultrasound Obstet Gynecol 2011; 37: 207-213. 3. Advantages of the population-based approach, two pregnancy dating Demonstrated with results from 23,020 ultrasound examinations Ultrasound Obstet Gynecol 2011. DOI: 10.1002 / uog.10081. 4. Bias in second-trimester ultrasound dating related to prediction models and fetal measurements. Thesis 2012 NTNU Inger Økland main challenge is: an evaluation of the two methods used in Norway today and an overview of the most commonly used methods in Western Europe, how they are validated and how they are in relation to our two Norwegian methods?" However, authors' names had been removed from the references; names which included Sturla H. Eik-Nes, Håkon K. Gjessing, Per Grøttum & Inger Økland, which included the 3 NCFM eSnurra claimed "copyright owners" (© 2007 EikNes, Grøttum og Gjessing) and the 3 original NCFM eSnurra Group members who supervised NCFM eSnurra Group member (and current Directorate of Health employee) Inger Økland's 2012 NTNU dr.philos. Thesis, and the 3 coauthors of NCFM eSnurra Group's Eik-Nes et al. 2005 and Gjessing et al. 2007, both of which appropriated and plagiarized Dr. Hutchon's original idea and method, the Hutchon Method of PDEE, as their own original idea and method thereby engaging in ongoing research misconduct via plagiarism for the last 12 years. If Grøgaard & Sommerstad had included the names: Sturla H. Eik-Nes, Håkon K. Gjessing, Per Grøttum & Inger Økland the effect would have been to identify Inger Økland as a published, supervised, mentored member of NCFM eSnurra Group since 2007 and, consequently, anything but an independent academic author. Moreover, Directorate of Health promoted (and continues to promote) Økland's 2012 NTNU dr.philos. Thesis (while deceptively upgrading this thesis to the status and prestige of an NTNU PhD Thesis) as independent, academic justification of their knowledge-obviated, medically & ethically flawed 2014 Recommendation; however, Directorate of Health has neither acknowledged nor disclosed the long-standing, entangled relationships among Inger Økland, NCFM eSnurra Group and Jens Grøgaard; relationships which clearly established Inger Økland (a current Directorate of Health employee) as anything but independent and certainly not free of conflicts of interest. Contrast this with the disclosures of Bergen Group Drs. Kessler and Kiserud (below) in their article: "Flawed recommendation issued by the Norwegian Directorate of Health concerning the determination of fetal age". Jørg Kessler, MD, PhD​: "The author has completed the ICMJE form and reports the following conflict of interest: He is a member of the research group that published the fetal biometry reference tables referred to in this article." Torvid Kiserud, MD, PhD: "The author has completed the ICMJE form and reports the following conflict of interest: He has developed an alternative method to the eSnurra obstetrics wheel, which is currently being recommended by Norwegian health authorities." NCFM eSnurra Group references identified to NOKC by Directorate of Health as the designated means for "the fix." If Directorate of Health had included Bergen Group's recognized fetal biometry trilogy of Johnsen et al. 2004, Johnsen et al 2005 & Johnsen et al. 2006 in their official request to NOKC, Directorate of Health would have provided some semblance of cover for "the fix," or at least a distraction from the blatant, corruption and arrogance in effecting "the fix" which, if it is not already, will soon be intuitively obvious to the most casual reader. Customarily, (i.e., in Chicago, where "the fix" and "clout" were/are well-honed trade craft), it is only the effects of ​"the fix" which are blatantly arrogant, while ​"the fix" itself is typically handled subtlety, with finesse (albeit with all the implied penalties or benefits), not with visible arrogance, and never, ever in a publicly available document. However, the Norwegian government enjoys a perception, real or not, internationally, for being open and transparent, which may serve to explain ​"the fix" being handled so obviously, transparently and publicly by Directorate of Health. Or, it could simply be another example of acting beyond their competence. Included below is the electronically filed request made to the Norwegian Knowledge Centre for the Health Services (kunnskapssenteret) (NOKC) by Jens Grøgaard and Cecilie Sommerstad, both Senior Advisers, Directorate of Health, on behalf of the Norwegian Ministry of Health & Care Services and Norwegian Directorate of Health. Some of the text has been color-coded to assist the reader in context tracking and analysis of the issues of: gestational age (GA) & estimated date of delivery (EDD or term) and the issues of pregnancy & abortion. 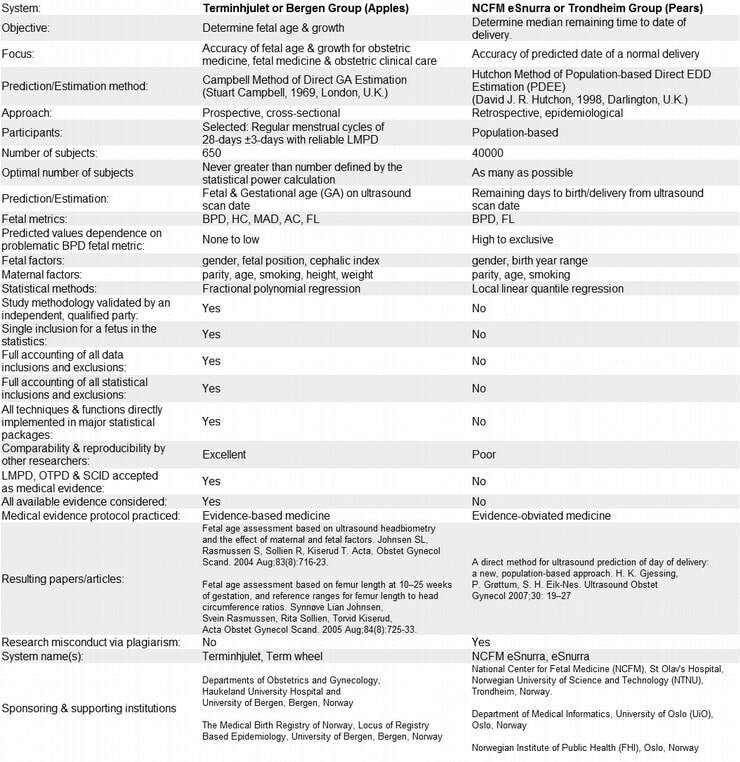 A quick look at the Issues Table below identifies Gestational Age and Pregnancy as the overwhelming, dominant issues, i.e., at least numerically. Additionally, the purple text in Directorate of Health's formal request to NOKC (below) identifies specific instances where Grøgaard & Sommerstad directed NOCK to deliver the answer Directorate of Health wanted, needed and expected. In fact, Grøgaard & Sommerstad provided the answer to NOKC and directed NOKC to deliver the provided answer (i.e., ​"the fix") back to Directorate of Health as NOKC's official answer. The Issue Table does not include issues located within these purple text sections. To be specific, ​"the fix" is in purple, underlined, text. NOKC's online request form's fields & questions are presented in black bold text. Background and reasons for the proposal: Directorate of Health has been commissioned by the Ministry of Health to clarify which method is most accurate and research-based assessment for pregnancy duration. Ministry of Health refers to the report Independent expert for assessment of abortions which was submitted on 8 April 2013. Norway has today two different ultrasound methods that underlie the assessment of pregnancy duration; Forward wheel and new e-snurra. Both methods are research-based and developed respectively at UiB and NTNU. Internationally, both methods well recognized and used in several countries. It is desirable that services for pregnant women are equal so pregnancy duration is evaluated with the same method nationally. Today the various methods are causing discrimination in border areas for late abortions, post-term pregnancies and lower limits of extreme prematurity (intensive care or not). There is currently a disagreement in professional circles in Norway in terms of how pregnancy duration is to be determined. It used different methods / tools that have different margins of error when calculating the exact number of weeks / days of a pregnancy. We want the Knowledge Centre to collect research that exists on the subject of calculation of pregnancy duration. We want an overview of the most commonly used methods in Western Europe, how they are validated and how they are in relation to our two Norwegian methods. We need evidence of the / the method (s) at any time of pregnancy provides the least uncertainty and "wiggle room" on the number of days when the duration of pregnancy is calculated. In a recently published doctorate degree in 2012 (Inger Økland, SUS) compared both methods. Can KS issue a statement about which method is considered to be the best science and that can be the basis for selecting the method for health authorities? Further description of the patient population / area that the measure is aimed at, for example. "Overweight Children" or "patients with first myocardial infarction": The choice of ultrasound method for determination of pregnancy length and term applies to around 60,000 pregnant women annually in Norway. The goal is equitable services across the country so that the four following conditions are not treated differently in the country. The following states are affected by various methods for pregnancy length and term: - Absolute upper limit for late abortion is legal to 21 weeks + 6 days. - National guidance for post-term pregnancy has fixed limits for added control and induction of labor. - Lower limit for intensive care of extremely premature infants should be equal nationally. - The upper limit for prematurity 36 weeks + 6 days and not premature baby 37 weeks. What product should be used, how the findings will be followed up. Study can lead to changes in Norwegian practice ? : What product should be used, how will the findings be followed up? Can the investigation method change Norwegian practice? The knowledge summary will be used to revise the Handbook on abortion work, and to ensure that health authorities who handle abortion cases use the same tool for estimating gestational age. This is significant when there is an application for abortion. By using various calculation methods of the various health authorities will be a risk that women in Norway do not get equal opportunities. The product could be the basis for recommendations in revised guidelines for pregnancy monitoring. Furthermore, the national statistics for births in Norway, MFR, was more consistent and accurate with regard to delimitation of late abortions, the lower limit of extreme prematurity, the upper limit of prematurity and post-term pregnancies. Other comments / explanations / questions: Other comments: Knowledge Centre in 2010 delivered a preliminary report on post-term pregnancies. This report has an overview of the knowledge base for overtime issue until 2010. References: 1. bias of traditional term prediction models: results from different sample based models evaluated on 41,343 ultrasound examinations. Ultrasound Obstet Gynecol 2010; 36: 728-734. 2. A new population-based term prediction model vs. two traditional sample based models: validation on 9046 ultrasound examinations. Ultrasound Obstet Gynecol 2011; 37: 207-213. 3. Advantages of the population-based approach, two pregnancy dating demonstrated with results from 23,020 ultrasound examinations Ultrasound Obstet Gynecol 2011. DOI: 10.1002 / uog.10081. 4. Bias in second-trimester ultrasound dating related to prediction models and fetal measurements. Thesis 2012 NTNU Inger Økland main challenge is: an evaluation of the two methods used in Norway today and an overview of the most commonly used methods in Western Europe, how they are validated and how they are in relation to our two Norwegian methods? (Perhaps report from 2010 gives something there?) One important point is different methodologies ability to determine duration of pregnancy at any time of pregnancy, not just determination of the term as well was the central issue in 2010. Included below is NOKC's official reply to Directorate of Health's official request made on behalf of Ministry of Health & Care Services and Directorate of Health by Jens Grøgaard and Cecilie Sommerstad, both Senior Advisers, Directorate of Health. NOKC's official reply cited 5 references: 1 Bergen Group publication from the Bergen Group's trilogy regarding femur length (FL) and 4 NCFM eSnurra Group publications (presented in red text) of which all 4 publications had appropriated and plagiarized the Hutchon Method of Population-based Direct EDD Estimation (PDEE) as part of NCFM eSnurra Group's 12 years of ongoing research misconduct via plagiarism. A link has been appended to each of the 5 references for, wait for it... easy reference. Gestational age and term currently have direct implications for the definition of absolute upper limit for late abortion (21 weeks + 6 days), lower limit for intensive care of premature birth, upper limit for prematurity and premature pregnancy. In Norway, term is predicted on the basis of routine ultrasound exams in weeks 17 to 19. Two different ultrasound-based methods are used, respectively, the "term wheel" (1) and "esnurra" (2), and the two methods are based on different prediction models that do not provide identical result (3). BakgrunnSvangerskapslengde og termin har i dag direkte implikasjoner for definisjonen av absolutt øvre grense for senabort (21 uker + 6 dager), nedre grense for intensivbehandling av ekstremt prematurfødte, øvre grense for prematuritet og overtidige svangerskap. I Norge predikeres termin på bakgrunn av rutinemessige ultralydundersøkelser i uke 17 til 19. To ulike ultralydbaserte metoder er i bruk, henholdsvis «terminhjulet» (1) og «esnurra» (2), og de to metodene baserer seg på ulike prediksjonsmodeller som ikke gir identisk resultat (3). To ensure equality across areas and regions, the health authorities want to define which methods and prediction models to be used to determine the gestational age and the term in Norway. This is the reason why the Knowledge Center received an order from the Directorate of Health in November 2013, where the Knowledge Center was asked to evaluate the precision of different tools for determining the gestational age and the term. For å sikre likhet på tvers av landsdeler og regioner, ønsker helsemyndighetene å definere hvilke metoder og prediksjonsmodeller som skal ligge til grunn for fastsettelse av svangerskapslengde og termin i Norge. Dette er bakgrunnen for at Kunnskapssenteret i november 2013 mottok en bestilling fra Helsedirektoratet der Kunnskapssenteret ble bedt om å vurdere presisjonen til ulike verktøy for å bestemme svangerskapslengde og termin. The primary objective of the Directorate's order is to obtain comparative data for the diagnostic accuracy of the "terminhjulet" versus "esnurra", which means the ability to predict the right term and the ability to provide correct measurements throughout the current measurement window. Traditional diagnostic validation studies require access to an unconventional reference standard for calculation of sensitivity and specificity, etc., but for term estimation there is no reference standard. It is natural to compare the predicted term with the actual date of birth, but since birth is premature and overtime, the date of birth is not a reference standard in the traditional sense. In the absence of the reference standard, other ways to validate the different prediction models must be found. Den primære målsetningen med bestillingen fra Helsedirektoratet er å innhente sammenligningsdata for den diagnostiske treffsikkerheten til «terminhjulet» versus «esnurra», det vil her si evnen til å predikere rett termin og evnen til å gi riktige målinger over hele det aktuelle målevinduet. Tradisjonelle diagnostiske valideringsstudier krever tilgang til en omforent referansestandard for beregning av sensitivitet og spesifisitet m.m., men for terminfastsettelse finnes det ingen referansestandard. Det er naturlig å sammenligne predikert termin med faktisk fødselsdato, men siden barn fødes både prematurt og overtidig er ikke fødselsdato en referansestandard i tradisjonell forstand. I fravær av referansestandard må man finne andre måter å validere de ulike prediksjonsmodellene på. One possible solution is to compare different prediction models within the framework of controlled studies or time series analyzes to see whether choice of prediction model affects measurable outcomes. It is possible to conduct a systematic search for such studies, but it is unlikely that such a search will lead to relevant findings. Én mulig løsning er å sammenligne ulike prediksjonsmodeller innenfor rammene av kontrollerte studier eller tidsserieanalyser for å se om valg av prediksjonsmodell påvirker målbare utfall. Det er mulig å gjennomføre et systematisk søk etter slike studier, men det er lite trolig at et slikt søk vil lede til relevante funn. Another validation strategy goes through studies where the properties of current methods are compared directly through measurements in the same population. In her doctoral dissertation from 2012 (4), Inger Økland conducted validation studies of three different prediction models ("snurra", "term wheel" and "esnurra"), a work that provides a good basis for assessing actual differences between different prediction models that are relevant in Norwegian context. Interesting projects are underway, among other things, new reference curves for symfyse fundus measurements (5) have been created that are calibrated for use in Norway with "esnurra". Preliminary searches do not indicate, however, that after 2012, validation studies have been published, where "term wheel" and "esnurra" are directly compared. En annen valideringsstrategi går via studier der egenskapene til aktuelle metoder sammenlignes direkte gjennom målinger i samme populasjon. I sin doktorgradsavhandling fra 2012 (4) gjennomførte Inger Økland valideringsstudier av tre ulike prediksjonsmodeller («snurra», «terminhjulet» og «esnurra»), et arbeid som gir godt grunnlag for å vurdere faktiske forskjeller mellom ulike som prediksjonsmodeller som er relevante i norsk sammenheng. Interessante prosjekter er i gang, blant annet er det laget nye referansekurver for symfyse-fundusmål (5) som er kalibrert for bruk i Norge med «esnurra». Foreløpige søk tyder imidlertid ikke på at det, etter 2012, er publisert valideringsstudier der «terminhjulet» og «esnurra» sammenlignes direkte. After an overall assessment, it seems unlikely that a systematic overview carried out in accordance with the Knowledge Center's method handbook will help to highlight the problem beyond what is already known. When the Directorate of Health determines which prediction model should be used to estimate the pregnancy length and term, it seems reasonable to base the decision on the findings presented in Inger Økland's doctoral thesis (4). Etter en helhetsvurdering virker det lite sannsynlig at en systematisk oversikt gjennomført i tråd med Kunnskapssenterets metodehåndbok vil bidra til å belyse problemstillingen utover det som allerede er kjent. Når Helsedirektoratet skal beslutte hvilken prediksjonsmodell som bør benyttes for å estimere svangerskapslengde og termin virker det følgelig rimelig å basere avgjørelsen på funnene som er presentert i Inger Øklands doktorgradsavhandling (4). If NOKC had included Bergen Group's Johnsen et al. 2004, i.e., fetal head biometery (HC & BPD) and gestational age) in with Johnsen et al. 2005 (femur length (FL) and gestational age with FL and fetal head ratios) in their assessment, there would have been a chance the problematic, unreliable BPD measurement would have been included as a discussion point in NOKC's "comprehensive assessment" ("helhetsvurdering"). Bergen Group's Terminhjulet or Term wheel relied/relies on the more robust fetal head circumference (HC) measurement, with the BPD measurement used as a cross-check and to assess fetal head shape when appropriate. Bergen Group's Terminhjulet or Term wheel uses HC & BPD to directly estimate gestational age and, therefrom, calculate EDD using the equivalent of Naegele's rule. (See: Warnings > BPD PROBLEMATIC) That said, comparing NCFM eSnurra Group's method (i.e., the appropriated, plagiarized Hutchon Method of PDEE) with the Bergen Group's Terminhjulet or Term wheel "really amounts to comparing apples to pears," as was stated by Bergen Group in conjunction with the problematic BPD with respect to NCFM eSnurra Group's unexplained BPD-based inclusions, exclusions and BPD measurement adjustments criteria and methods in their Gjessing et al. 2007 study. Interestingly, in a 2008 study Norwegian Knowledge Centre for the Health Services (NOKC) explicitly stated: 1) NOKC's purpose with respect to "Evidence-informed Health Policy Using Research" and 2) NOKC's supposed scientific and professional independence from Directorate of Health. [Note: In January of 2016, NOKC separated from Directorate of Health and joined the Norwegian Institute of Public Health (NIPH).] It would appear NOKC's 2008 study was ignored with respect to Directorate of Health's knowledge-obviated, medically & ethically flawed 2014 Recommendation. "We believe that current EBM-based NOKC studies seek to provide a legitimate basis for health policy decision-making in Norway, and we endorse the idea that certain domains of inquiry may be well suited to such approaches. However, given the large proportion of recent NOKC deliveries that lack substantial conclusions, we must also reflect on the potential policy consequences of ‘empty’ knowledge deliveries. As a broad range of complex interventions cannot be adequately evaluated by the EBM format, there will be limited availability of ‘authorized’ research documentation, and SRs will be unable to offer strong conclusions about positive effects. This is not the same as documentation of negative or zero intervention effects. Often, the issues leading to SR commissions are controversial, and the delivery is expected to recommend a direction or choice. The present findings highlight the possibility of policy decision-making in which political interests (as in “this government does not want to support such a reform”) may be legitimized by SRs that draw weak or deficient conclusions, which are then interpreted as evidence-based warnings against the intervention in question. In this way, the EBM evidence hierarchy may actually contribute to concealing the foundation of policy decision-making rather than providing transparency." In the excerpt below, Torunn Janbu, dr.med. (MD, PhD), Head of the Department of Hospital Services, Norwegian Directorate of Health, falsely stated it was NOKC who had "pointed out" the "validation strategy" (i.e, Økland's 2012 NTNU dr.philos. Thesis, ​"the fix"). Moreover, the 3 papers published in Ultrasound in Obstetrics & Gynecology included in Directorate of Health's request to NOKC, were also included, separately, within Økland's 2012 NTNU dr.philos. Thesis. These same 3 papers are the 3 references Torunn Janbu cited "(7 – 9)" in her article in Tidsskr Nor Legeforen. Consequently, it is clear NGF and others had not been excluded from the decision-making process by Directorate of Health because there was no decision-making process; ​"the fix was in" (Again, see Merriam-Webster: the fix is in; See Wictionary: the fix is in). Moreover, in her article in Tidsskr Nor Legeforen, Torunn Janbu deceptively misrepresented Økland's NTNU degree credential as a PhD degree when NTNU had conferred a dr.philos. degree upon Økland. Økland's NTNU dr.philos. degree was well-known to Jens Grøgaard, Senior Adviser, Directorate of Health given he served on Økland's thesis Assessment Committee. Also, Inger Økland was, and is, a medical doctor with a specialty in obstetrics. Most people would consider this an important relevant fact for full disclosure considering the subject matter of gestational age and estimated date of deliver. However, it is apparent Torunn Janbu thought differently while she misrepresented and promoted Økland's academic credentials and Økland's 2012 NTNU "PhD" Thesis, respectively, simultaneously. "BarneSak AS. MD and PhD Jens B. Grøgaard is a pediatrician who has participated in the age estimation of young asylum seekers in Norway from 2009 to 2013." until Grøgaard was found to have breached multiple tenants of medical ethics by the Medical Ethics Council of the Norwegian Medical Association (below)​. Jens Grøgaard's company, BarneSak AS (Org No. 912283224) was founded in 2013 and reported operating profits (in 1,000 NOK) of: 1,290, 3,831 & 3, 627 in 2014, 2015 & 2016, respectively, for a cumulative reported operating profit of 8,748 NOK (in 1,000 NOK) or 8,748,000 NOK. For U.S. readers, that was a little more than $1 million. Ergo, the cost-benefit analysis is straightforward: Cost = ethical criticism amounting to a wrist slap; Benefit = $1,000,000 USD or 8,748,000 NOK, which may only serve to quantify a key economic distinction between Doctors with Borders and Doctors Without Borders. An 04.01.2016 article in VG NYHETER titled "Uses millions for controversial age tests" ("Bruker millioner på omstridte alderstester") identified the process, some of the participants and some of the costs (below) as well as the full story. In a 23.12.2016 article in ABC Nyheter, it was reported "Doctor gives up after criticism of age tests for UDI"
"The doctor Jens Grøgaard terminates the agreement with Immigration about age testing of unaccompanied minor asylum seekers following criticism from the Council for Medical Ethics, reports TV2." ​"Legen Jens Grøgaard har sagt opp avtalen med Utlendingsdirektoratet om alderstesting av enslige, mindreårige asylsøkere etter kritikk fra Rådet for legeetikk, melder TV 2." "There has been a great strain on the family, and I want to put this behind me, the doctor says to TV2 ." "Det har vært en stor påkjenning for familien, og jeg ønsker å legge dette bak meg, sier legen til TV 2." "Former head of the children's department at Ullevål Hospital, Jens Grøgaard, elected 1700 children in 2016. He is now chairman and director of the private company Barnesak AS. The company had a turnover of 4 million in 2015 with a profit of 2 million (purehelp.no). Unilabs who perform X-rays of minors left wrists and the Faculty of Odontology as X-rays photograph the teeth of the children, both send their reports to Grøgaard. Furthermore, he delivered an overall assessment to the UDI about the children's age, without having met them. Grøgaard has been heavily criticized by colleagues for the past three years with assignments from the UDI to use an unsuitable age test." "​Tidligere leder av barneavdelingen på Ullevål sykehus, Jens Grøgaard, alderstestet 1700 barn i 2016. Han er nå styreleder og direktør i privatselskapet Barnesak AS. Selskapet hadde en omsetning på 4 millioner i 2015 med et overskudd på 2 millioner (purehelp.no). Unilabs som utfører røntgen av mindreåriges venstre håndledd og det Odontologiske fakultet som røntgenfotograferer tennene til barna, sender begge hver sin rapport til Grøgaard. Videre leverer han en samlet vurdering til UDI om barnas alder, uten å ha møtt dem. Grøgaard har de tre siste årene med oppdrag fra UDI blitt kraftig kritisert av kollegaer for å bruke en uegnet alderstest." "The leader of the Child Radiology Association says that resistance is strong against the method because the child's living conditions, diet, ethnicity, and health conditions affect the age. Everyone who knows teenagers knows that they are developing at an uneven pace. It is not possible to take an X-ray of the carpus of a child of unknown age, compare with the image atlas, to determine the age of the child. The error margin appears to be up to five years (Sæther, 2016)." Included below are 2 excerpts from the article "Criticism to the doctor for age testing" ("Kritikk til lege for alderstesting") by Tove Myrbakk, Nordland legeforening, Den Norske Legeforening 12. desember 2016, which articulates Jens Grøgaard's breaches of medical ethics and the associated criticisms delivered by the Medical Ethics Council of the Norwegian Medical Association. "The letter from the Council for Medical Ethics states: "The Council would like to note that the accused physician performs a very specific case-law mission for the UDI. It is not a medical indication for the investigations, and the method used is controversial. Age assessment with X-ray of hand rot and dental examination requires valid consent, ie the consent is given on the informed basis of a consent person. There is reason to question whether voluntary informed consent is possible for these investigations."" "They further state that "the evaluating physician has a special responsibility to ensure that the requirements according to ethical rules for chapter 1, sections 1 and 2 are taken care of. The Council of Medical Ethics finds that the accused doctor, by conducting the age-testing of minors, single asylum seekers based on unsafe methods that he himself states are "not as good as desired" and without the opportunity to secure a valid consent, has acted contrary to ethical Rules for doctors chapter 1, §! 2 and 9. In addition, the Council considers that he has issued expert statements which, in the opinion of the Council, are not based on "as extensive surveys as the purpose suggests, cf. Chapter IV, Section 3. The Council of Medical Ethics, on this basis, gives criticism to the accused doctor for violation of Ethics rules."" Included below are the relevant sections and paragraphs of the Code of Ethics for Doctors which Grøgaard breached, as published by Den norske legeforening "Code of Ethics for Doctors - Adopted by the Representative Body in 1961 and subsequently amended, most recently in 2015." § 1 A doctor shall protect human health. A doctor shall cure, alleviate and console. A doctor shall help the ill to regain their health and the healthy to preserve theirs. A doctor shall base his practice on respect for fundamental human rights, and on truth and justice in relations with patients and to society. § 2 A doctor shall safeguard the interests and integrity of the individual patient. Patients must be treated with caring and respect. Cooperation with patients should be based on mutual trust and, where possible, on informed consent. Doctors have different roles as treatment provider, expert and administrator of welfare benefits. These roles have a bearing on how doctors behave, and how they treat sensitive information. A clear distinction must be made between their roles of treatment provider and expert. Doctors are responsible for providing necessary information and appropriate information about their role and the purpose of the contact. § 9 In examinations and treatment a doctor shall only employ methods indicated by sound medical practice. Methods which expose the patient to unnecessary risk shall not be employed. If a doctor does not possess the skill a method calls for, he or she shall ensure that the patient receives other competent treatment. While profiting, handsomely, from BarneSak AS, Grøgaard made a lateral expansion into a new market where he could leverage the same strategy but with one, 180-degree twist. He used his knowledge and experience from establishing an exclusive provider of medically & ethically flawed evidence-manufactured medicine (i.e., dubious x-ray-based "official certification" of medical age) for Norwegian Directorate of Immigration (UDI) to establishing an exclusive provider of evidence-obviated medicine for Norwegian Directorate of Health's knowledge-obviated, medially & ethically flawed, intentionally reckless, willfully negligent 2014 Recommendation with their exclusive implementation of NCFM eSnurra Group's "method" (i.e., the appropriated, plagiarized, misused Hutchon Method of PDEE) within a government-mandated protocol of evidence-obviated medicine with respect to obstetric medicine, fetal medicine and obstetric clinical care. All without securing a pregnant woman's prior, informed, voluntary, explicit consent; thereby, placing control of all age-related pregnancy and abortion decisions under the control of Directorate of Health with their exclusive NCFM eSnurra Group implementation; an implementation for which 3 NCFM eSnurra Group members Sturla H. Eik-Nes, Per Grøttum and Håkon K. Gjessing claim to be the "copyright owners," (© 2007 EikNes, Grøttum og Gjessing), as stated on the NCFM eSnura website, of which It would appear Jens Grøgaard, Senior Adviser, Directorate of Health, was able to make his lateral expansion into the market of establishing estimated date of delivery (EDD), gestational age (GA) and fetal age for all pregnancies and abortions in Norway, effortlessly, because Jens Grøgaard was neither burdened nor conflicted by his knowledge of the fact that what he was doing was medically & ethically flawed and willfully negligent. "Lastly a word on the centrality of the patient in any discussion on medical ethics. Most medical associations acknowledge in their foundational policies that ethically, the best interests of the individual patient should be the first consideration in any decision on care. This course will only succeed if it amplifies this imperative – TO PUT THE PATIENT FIRST." This "Fundamentals of Medical Ethics" course was authored by John R. Williams, former Director of Ethics at the World Medical Association (WMA). Interestingly, Torunn Janbu, Director of Hospital Services of the Specialized Health Care Services, Norwegian Directorate of Health is a former President, Norwegian Medical Association (2005-2007) and a former Chairperson, Medical Ethics Committee of the WMA (2010-2013). Consequently, one can only wonder how the wheels came off Torunn Janbu's medical ethics wagon with respect to her leadership role in promoting, deciding and implementing Directorate of Health's knowledge-obviated, medically & ethically flawed 2014 Recommendation; a Recommendation that implemented a protocol of evidence-obviated medicine; a Recommendation which serves as a textbook example of systemic, harms-causing misconduct, manipulation and corruption.